Samsung PS51D495 review | What Hi-Fi? 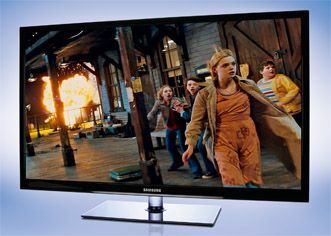 If you are looking for a low priced plasma TV check out this £710 Samsung. And that isn’t even the cheapest price we found when doing our research, so shop around and you could bag a 3D plasma for well under £700. This TV looks much more premium than its price tag suggests, and at just 56mm deep it’ll look extra stylish on the wall. Of course, at this price, sacrifices have been made – so the resolution is just 1365 x 768 and there’s no web content, despite the presence of a LAN socket (used for firmware updates). The D495 does, however, have a Freeview HD tuner, and as the part number-decoders among you will have gathered, the panel actually measures 51in on the diagonal. The same is true of the EPG, which is a pleasant combination of a Freeview mini-picture in the top-left with a clear table of channels below. Selecting Dickinson’s Real Deal, the Freeview tuner proves very capable. True, the worst of the bad patterned suits confuses the D495 a bit, but the D8000 struggles with the same pattern. In fact, other than a little missing detail, the D495 gives little away to its sibling, and produces a picture with vibrant, controlled colours and little noise. Switch to The Dilemma on DVD and the Samsung impresses again. There’s a surprisingly small gap in detail between it and the D8000, which means it’s more insightful than some rivals. Contrast isn’t as impressive as the more premium sets in the test, but the D495’s combination of deep blacks and punchy whites is very impressive for the money. Of course, an HD Ready TV doesn’t have to work as hard as a Full HD set when upscaling, but it works harder when playing a Full HD Blu-ray, as it’s having to downscale the image to match its panel. However, while the D495 has its limitations, it’s still a decidedly impressive displayer of Blu-rays. Spin up Let The Right One In and its detail, edge definition and black depth put the LG 50PW450 – and the budget price tag – to shame. In isolation, the performance would be very hard to fault; only some rather juddery motion lets the side down. Perhaps unsurprisingly the Samsung struggles more with 3D. The motion issues are exacerbated and it lacks the resolution to make the 3D images really pop from the screen or immerse you in the action. But it’s a very clean picture, and watching Despicable Me is enough of an enjoyable, non-tiring experience to seem like very good value for money. The budget clearly didn’t stretch to decent speakers, though. Audio is hard and scruffy, and cluttered and bright if you select the TruSurround mode. it an extremely affordable 3D plasma, it’s actually a very capable one.